Did you know that you are on purpose already? Did you know that PURPOSE is not hard to find, it is why you are here, now, in the moment? Are you searching for your purpose? Do you feel stuck in a rut and believe that you are destined for more, much more than what you are doing now? Stop searching, you are purpose already! Believe that your presence on earth and your journey thus far are part of the process that leads you to purpose. Every day, every encounter, every task is part of your purpose. With what intent are you doing this? Check in with your heart daily; the more joyful you are, the more you connect to purpose. The more heart stuff you do, the more purpose becomes. Do what makes your heart sing, and if you are not doing that right now, sing for joy that you are on a temporary path that is necessary for you to get to purpose. As you do this, all paths, opportunities and introductions will lead you further into your specific purpose. Perhaps you feel that you are on purpose and that it is taking too long to unfold to perfection, to where you want to be ultimately… have faith, it is all unfolding as it should. Take one day at a time, act with intent and show kindness, compassion, understanding and love in all you do and all you meet. This ultimately is purpose. So, just for today, smile at someone, give of yourself, extend compassion, do little acts of joy. 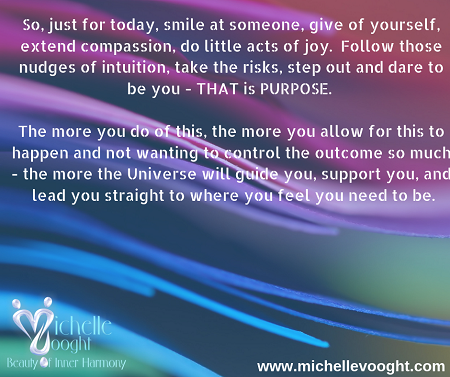 Follow those nudges of intuition, take the risks, step out and dare to be you – THAT is PURPOSE. The more you do of this, the more you allow for this to happen and not wanting to control the outcome so much – the more the Universe will guide you, support you, and lead you straight to where you feel you need to be.